A team of IMET-UMBC researchers has made history by successfully raising Atlantic bluefin tuna from eggs to juvenile stage in a recirculating, land-based mariculture system for the first time in North America. 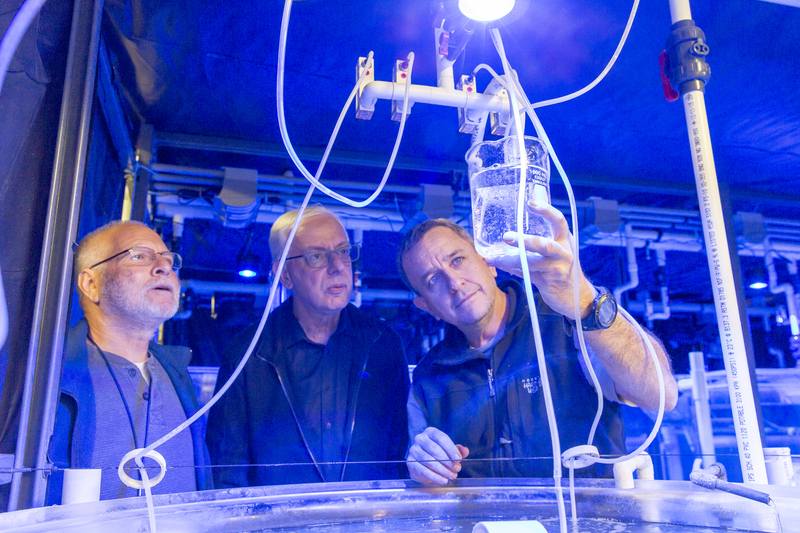 Scientists at the Institute of Marine and Environmental Technology (IMET) overcame significant challenges in creating the successful, sustainable aquaculture system — roadblocks that had previously frustrated researchers for years. A sharp increase in demand for bluefin tuna in the sushi industry has intensified fishing of the species, fueling seven-figure prices for individual fish and depleting populations. In 2015, the World Wildlife Fund’s Living Blue Planet Report identified Atlantic bluefin tuna as a species that is experiencing one of the steepest declines. Current bluefin tuna farming depends on capturing and fattening wild fish for Japanese and broader global markets, but declining supplies and growing demand have created a strong interest in developing better aquaculture techniques. “We must stop overfishing this major icon of the oceans. Our research aims at closing the life cycle of this fish, so juveniles can be produced in captivity to enable alternative, environmentally-responsible practices to satisfy the growing global appetite for bluefin tuna through aquaculture,” said Yonathan Zohar, professor and chair of marine biotechnology. Zohar explained that findings from the most recent research are a first step toward developing environmentally-sustainable commercial aquaculture of this tuna species in the U.S. To raise environmentally sustainable Atlantic bluefin tuna through aquaculture, the full life cycle of the fish needs to be completed in captivity. To acquire the larvae to begin the current cycle of research, the UMBC team partnered with a Croatian company that holds bluefin tuna in floating netpens in the Adriatic Sea. The fish, weighing 540-550 lbs. each, were injected with hormone-based, controlled-release implants, developed by Zohar, which triggered massive spawning during July-August 2015. The fertilized eggs were collected and shipped to IMET’s Aquaculture Research Center, where they arrived about 40 hours later as freshly hatched larvae and were placed in tanks equipped with recirculating water systems. “It took an incredible amount of coordination between the university and our external partners across the Atlantic ocean, as well as internal coordination among the hatchery team members at IMET, to achieve this level of culture success,” said John Stubblefield, faculty research assistant. The researchers tested various combinations of food, dietary supplements, and environmental factors to determine what was most effective in supporting the tuna’s healthy growth. Identifying that ideal balance of microalgae, lab-grown zooplanktonic feeds, larvae of other marine fish, plus vitamins, omega-3 oils, and probiotics enabled the team to grow tuna to 4-5 inches long at age 60-70 days, officially reaching juvenile status. The tuna were raised in simulated oceanic conditions, with careful regulated temperature, salinity, light intensity, and hydraulic currents, Zohar explained. The researchers began facing additional challenges once the tuna grew to between 3 and 5 inches in length because the tanks in the Aquaculture Research Center at IMET were not large enough for the fast-moving tuna to continue to thrive. Once they reach this size, the fish must be transferred to much larger tanks or sea-based floating netpens to survive. The scientists are now exploring solutions to this current challenge. “It took many years before hatcheries could mass-produce other marine fish that are now common in aquaculture. I believe tuna production will follow this same pattern, but we learned so much from these prior experiences with other species that it will hopefully be a shorter, smoother learning curve this time,” said Odi Zmora, research supervisor.